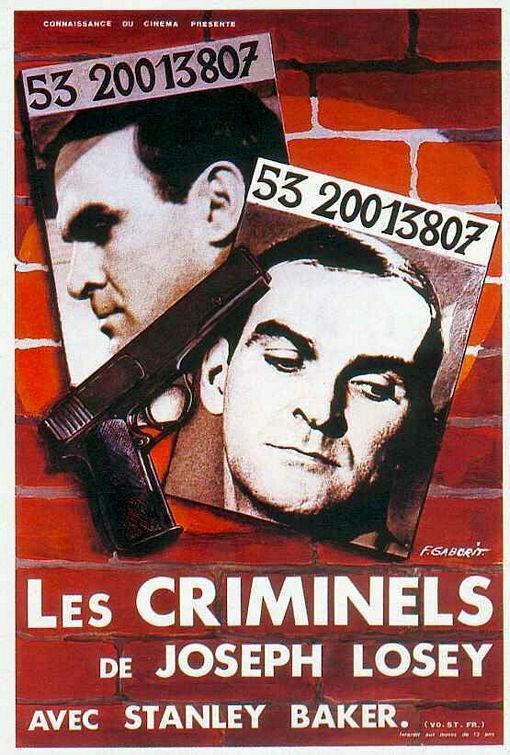 The Career Criminal might have served as a better title as that’s just what Stanley Baker is in this black and white effort that serves as a character study as opposed to an outright gangland film that one might have seen portrayed by Cagney or Bogart had it been filmed twenty years earlier on the Warner’s lot. It’s ripe with a cast of well known faces surrounding our leading man who serves as the top dog in his cell block. 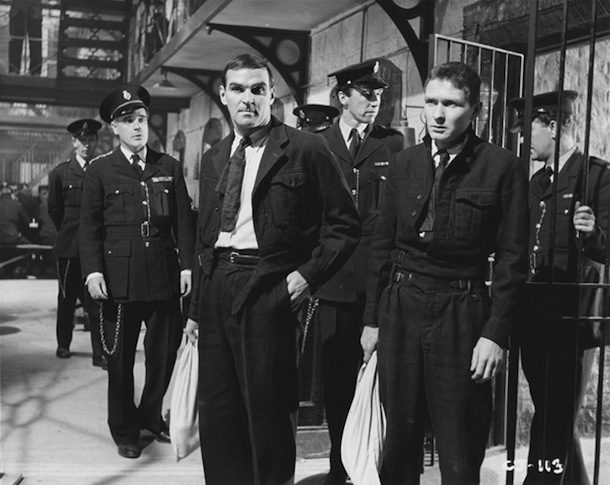 There’s a bluesy song playing to match the overall feel of this Joseph Losey film as the credits close and a new inmate is being brought into the main population of Baker’s block. It’s an informant and he isn’t welcome. Word quickly spreads that ‘Kelly is back.” Played by Kenneth Cope, he’s scared for his life and rightly so. 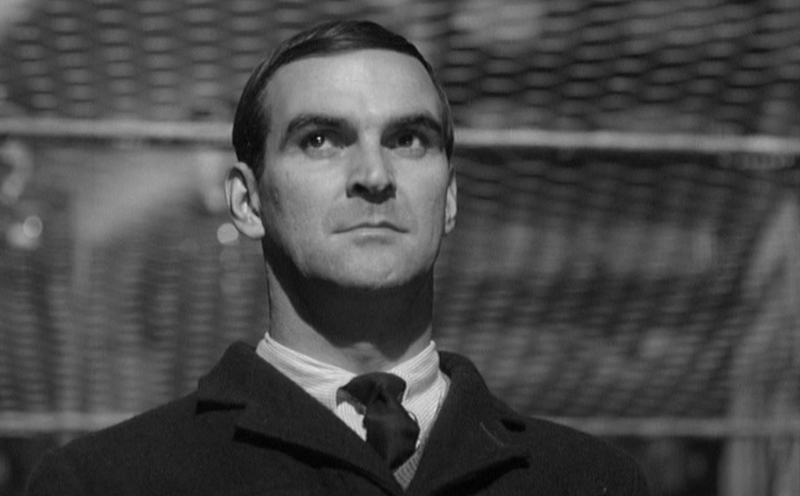 His saving grace might be that Baker is to be released from prison the following day and chief guard Patrick Magee warns Baker not to ruin his release in the morning. Baker may be getting out in the morning but that doesn’t mean that he won’t see that jailhouse justice is carried out. Once released by warden Noel William, Baker will quickly fall in with the wrong people led by Sam Wanamaker. Baker has a heist firmly in mind and with Wanamaker as his connection to the underworld, sets the plan in motion while at the same time turning his back on long suffering Jill Bennett and taking up with a new “bird”, Margit Saad. Women have very little importance in this world of crime and the men that populate it. The actual heist goes off without a hitch and interestingly, the director chooses to film very little of it. The men go into a building at a race track where a large stakes race is running and soon exit the building with bags in hand. Baker loads the cash into a suitcase and buries it in a large isolated field until the heat dies down. Detective Laurence Naismith is on him at once and once again, little is made of the arrest on camera. The arrest only serves to put Baker back in prison population and in a cell block he isn’t comfortable with. Intimidation will only serve to show us just how violent Baker can be when Magee sees to it that Baker is put into a cell with a couple of “heavies.” The second go around in prison isn’t as easy as the first. Baker wants out and when Wanamaker begins to pressure him for the whereabouts of the cash by threatening to harm Baker’s gal, the internal rage begins to rise. Hearing that one of the men on the job has been killed by Wanamaker in an effort to locate the money sends Baker over the edge and he makes a deal to give up the cash in order to get out from behind the prison walls and dish out his own brand of justice. It’s like each and every character is a pawn in a larger game than they are even aware of. Time to stop with the plot points but I will say that I love the final fadeout scene of this crime drama that leaves one to realize the futility of it all and to also mention I love Baker’s final scene in the movie. I would assume that most viewers who don’t make a habit of watching older films might find this one far too tame during the prison scenes. I’ll even acknowledge that these hardened gangsters seem like they are at a detention hall as opposed to doing hard time. Still, Baker stands tall among those incarcerated alongside him. There’s numerous connections here for fans of Hammer Productions of which yours truly numbers himself. 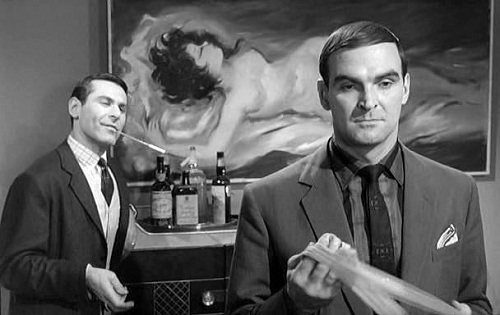 The script is written by Hammer regular Jimmy Sangster and the cast of actors in the background is sprinkled with faces who turned up in Hammer Horrors. Rupert Davies, the warden Noel Willman, Patrick Wymark, John Van Eyssen, Edward Judd, Kenneth J. Warren and Nigel Green who appeared in a number of Baker films including Zulu. Not surprisingly, Green is up to no good here in the type of role he seemed to excel at. And speaking of horror film connections, doesn’t the actor playing the guitar and singing of foreboding things to come remind you of Sir Galahad doing the exact same thing in the Val Lewton chiller, I Walked With a Zombie? 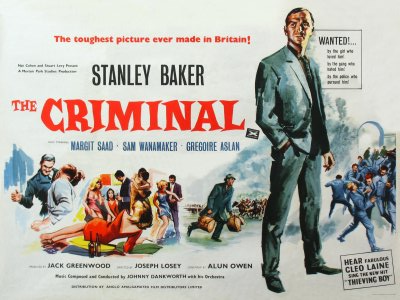 A solid performance from Baker leads the way in this film also known under the title Concrete Jungle. Released in North America a number of years ago by Anchor Bay on DVD, this one might not be too hard to locate should you be looking to acquire it. A worthy addition to the list of portrayals from Mr. Baker that leaned heavily on his brooding persona that the camera seemed to capture so well. The cover for the dvd on IMDb with the black and blue artwork looks just like a comic book crime noir series also called “Criminal” I’ve got by Ed Brubaker and Sean Phillips. Brilliant read. It’s a bit of a time capsule and perhaps aged but Baker delivers and Wanamaker a character you just want to punch I the mouth!